Ok, another time for a bad blogger alert – as it’s actually a few months since I had this treatment and neglected to write about it straight away *slaps self on wrist*. But, better late than never! I’m on a bit of a skincare/beauty mission at the moment with the wedding looming and when I got to thinking about facials to have and routines to get into (I have a decent enough skincare routine, but do switch products to try and test frequently) I thought back over a few facials I have had and found my notes on this one. The 111Skin Micro Pen Facial is one that’s a bit more ‘extreme’ than a regular product/massage based one – as this includes tons of small pricks being made into the skin using the micro pen, with the idea being that the skin then is forced to produce more collagen to get the skin healing and repairing from the slight damage of the micro pen. I have had a similar concept facial treatment called ‘Dermaeraze’ previously, and whilst at the time I was pleased with the results. In hindsight, these didn’t last that long and the healing time wasn’t worth it (crusty scabbing under-eye area? No thank you…). Because of this healing time experience before, I was a little nervous going for my 111Skin facial – but my therapist was very reassuring, answering all the questions I had thoroughly and I felt in good hands. Due to my nerves, she kept the treatment on the lowest setting – meaning that the needle incisions would only go to a very shallow depth. Pain wise, there was none – a slight discomfort around ares where bone is closer to the skin surface (nose, temples, chin). Skin afterwards felt quite warm, like I had been in the sun for a bit too long- which is why they apply the wonderful Brightening Activator and Moisture Infusion System mask. These are my favourite thing about the treatment – so cooling and hydrating, these are amazing and well worth a purchase even if you don’t have the full facial. These would be amazing for any post flight/hangover/sunexposure type situation where skin needs a moisture boost and a bit of cooling, soothing action. 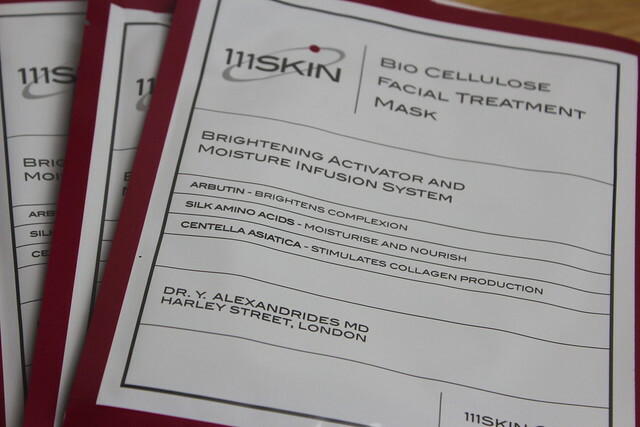 I was a guest of 111skin for the facial treatment.